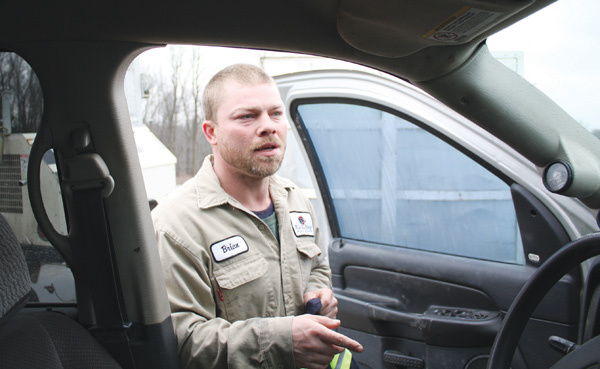 Brian Rose, above, is a roustabout for a natural-gas drilling company, whose Dodge 4x4 truck sometimes doubles as a dressing room. Rose’s responsibilities vary from picking up trash to repairing the liners that contain chemicals. He is responsible for general-labor duties on a rig. On a brisk March morning in a field off of state Route 172 in Lisbon, the air is filled with the rumble of machinery and the smell of diesel fuel. Combine that with the gray skies, the bare trees and the drilling equipment, and the scene it creates isn’t exactly picturesque. On this day, workers plan to move equipment from a natural-gas injection well. They pay no attention to the weather as they swarm the well. They perform their duties in perfect synchronicity. Just beyond the frenzy is 35-year-old Brian Rose, who just parked his Dodge 4x4 with drilling-company graphics displayed on its sides. Today, the truck doubles as a dressing room. He pulls on overalls with yellow visibility tape contrasting against the black, grease–stained fabric. On one side there is a patch with his name. On the other is the name of Black Bear Oil Corp. He will wear this outfit for the next 13 hours. Rose is a roustabout, the low guy on the natural-gas drilling totem pole responsible for general operations on a rig. His responsibilities range from picking up trash to repairing containment — liners that prevent the release of dangerous chemicals into the environment. This doesn’t surprise Tracee Joltes, assistant director for workforce outreach at Eastern Gateway Community College in Youngstown. A native of Hamilton, a small city about 30 miles north of Cincinnati, Rose previously built limousines. But the money wasn’t there. With a family to support – his girlfriend Jessica Campbell and two sons, ages 8 months and 2 years – bills began to pile up. “Work got scarce, and I followed the work,” he said. A friend told Rose about a job opportunity in the natural-gas drilling industry. Following the work meant moving his family to a mobile home in Salineville. Rose works two weeks straight with a week off. He earns enough to let Jessica stay home with the kids. Roustabout salaries range from $21,860 to $51,550 yearly, according to the Bureau of Labor Statistics. Those paychecks do not come without risks, however. That danger became more real Feb. 25, when Abdal L. Audeh, 28, of Dover was killed and Alex Cox, 21, of Cadiz was injured in Carroll County on a rig owned by R.E. Gas Development, a subsidiary of Rex Energy. Sheriff Dale Williams said the two had forgotten to hook up a safety line on the drilling equipment they were working on and a piece of the equipment swung around killing Audeh. Cox was able to move out of the way. Faced daily with the reality of injury or death, Rose keeps his guard up. Rose isn’t the only one concerned with safety. Drilling companies say they stress it as well. Those consequences can include being suspended without pay. Rose does not have long-term plans as a roustabout, citing his age, the work schedule and the job itself. Despite the lifestyle and risks, Rose said being a roustabout is a good job. TheNewsOutlet.org is a collaborative effort among the Youngstown State University journalism program, Kent State University, The University of Akron and professional media outlets including, WYSU-FM Radio and The Vindicator (Youngstown), The Beacon Journal and Rubber City Radio (Akron).